Mickey Mouse made his public debut in the short film Steamboat Willie way back in 1928. It was the first cartoon film with synchronized sound which made the film, along with its star, an overnight sensation. The movie forever changed the world of animation and launched a brand-new empire full of funny, cool, clever, caring, silly and mischievous characters. Fast forward 90 years and the world’s most famous mouse embodies the adventurous, lovable optimist in all of us and has become one of the world’s most beloved original icons. Thomas Kinkade Studios would like to congratulate Mickey on his 90th Anniversary and for showing us all that dreams really do come true. 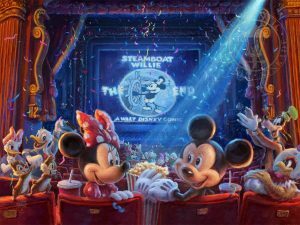 Minnie Mouse, Mickey Mouse’s original co-star from Steamboat Willie, has invited some of their most treasured friends to celebrate the film’s 90th anniversary. Six of Walt Disney Studios most famous ducks are in the theater — can you spot them all? Even Pete, a long-time nemesis of Mickey Mouse, is here to celebrate this notable anniversary. Clarabelle Cow – who Mickey struggled to load into the boat in her debut in Steamboat Willie – along with old-time regulars Horace Horsecollar and Clara Cluck, have come out to congratulate their longtime friend. Chip and Dale found some time to take a break from their mischievous tendencies to give Mickey a well-deserved round of applause. Goofy first appeared in Mickey Mouse’s 1932 short film Mickey’s Revue, few know that back then he went by the name Dippy Dawg. Do you get the Thomas Kinkade Studios Newsletter? Be the first to know about new paintings, specials and Thomas Kinkade Studios events. Almost Done...Please check your email to confirm your subscription. Thank You!